I recently had a delightful molded pudding at a very nice restaurant. It was a little firmer, and jiggled a little more, than traditional puddings–and I wondered how it was made. Then I saw a recipe in an advertisement in a hundred-year-old magazine for American Cream that looked like it might make a dessert similar to the one I’d eaten in the restaurant, so I gave it a try. The American Cream was all that I’d hoped it would be. It was creamy with just hint of sweetness. And, when topped with Chocolate-flavored Whipped Cream, it was almost decadent. When I served this dessert, guests enjoyed the American Cream; they absolutely raved about the Chocolate-Flavored Whipped Cream. Whisk egg yolks until smooth, add salt. Set aside. Put 1/4 cup milk in a small dish. Sprinkle gelatin and sugar evenly over the cold milk and allow the gelatin to absorb the milk. Set aside. Put egg whites in a small bowl, and beat until stiff peaks form. Set aside. Heat the 1 3/4 cups milk in a saucepan using medium heat until it comes to a boil. Quickly stir in gelatin and sugar mixture; then add the egg yolks while stirring constantly. As soon as it returns to a boil remove from heat, and immediately fold in the beaten egg whites. Stir in the salt and vanilla. If not smooth, press the mixture through a sieve. Put in a serving bowl, or spoon into individual serving cups or glasses. Chill for at least 3 hours in the refrigerator. Serve with Chocolate-flavored Whipped Cream. Chocolate-flavored Whipped Cream: Place the whipping cream in a bowl and beat until stiff peaks form. Add confectioners sugar and cocoa, and continue beating until thoroughly mixed. Posted on February 25, 2018 February 25, 2018 by SherylPosted in FoodTagged dessert. Next Next post: Does it Insult the Cook if You Salt Food on Your Plate? Oh yum! A great find. The Chocolate-flavored Whipped Cream is absolutely wonderful. I’m surprised that it doesn’t seem to be a commonly used dessert topping. I’m going to have to keep my eyes open, and see if I come across any recipes for Chocolate Cream. It sounds good. I tried and tried to find it today, and couldn’t. It’s not one of those layered desserts. As I recall, it was butter, powdered sugar, melted chocolate, and maybe a little peppermint. I don’t remember eggs, or whipped cream. It was put into a loaf pan or paper cups and refrigerated. It was so rich and dense that it didn’t take much to make everyone smile! Now, I’m really intrigued. It sounds decadent – but delightful. I found it. As soon as I saw the name, I remembered: French silk. Here’s the recipe that seems to most closely resemble my mother’s. turns out that a woman named Betty Cooper won the 1951 Pillsbury Bake-Off with the recipe. I’ll add another link to an article with some of the history below. This makes sense now — it certainly explains why every woman in sight was making this when I was a kid in the 50s. I suppose it fell out of favor because of health concerns over butter and the use of raw eggs. Never mind that; I’m going to make this as soon as an occasion arises: like the weekend. Here’s the link that includes some history and a slightly different recipe. mmm. . . French silk pie probably isn’t very healthy but it’s so tasty. It’s the favorite pie of one of my sons. I enjoyed reading the history of this pie. I had no idea that it was a bake-off winner. That looks so good. I definitely need to make chocolate whip cream. You’ll really like the chocolate whipped cream. It’s tasty. Oh that looks mouth watering and scrumptious! Good for you to remember the recipe you had seen. I’m not much for whipped cream but I do love chocolate. Since you like chocolate, you might like this topping. It’s a nice addition to the whipped cream. I can hardly wait for local strawberries to be in season. They are so much tastier than the supermarket varieties. It did make a nice presentation. I had fun trying to replicate the old picture. I bet you did! You do good work, Sheryl! This sounds so good! I have a new mixer (finally) and I’m going to try this one soon! And I love the plate in your picture as it’s perfect for an old fashioned modern desert! I think that you’ll like it. The plate is part of a lovely vintage tea set that I have that sits hidden on a top shelf in the kitchen cabinets. I should invite friends over sometime for tea and use it. 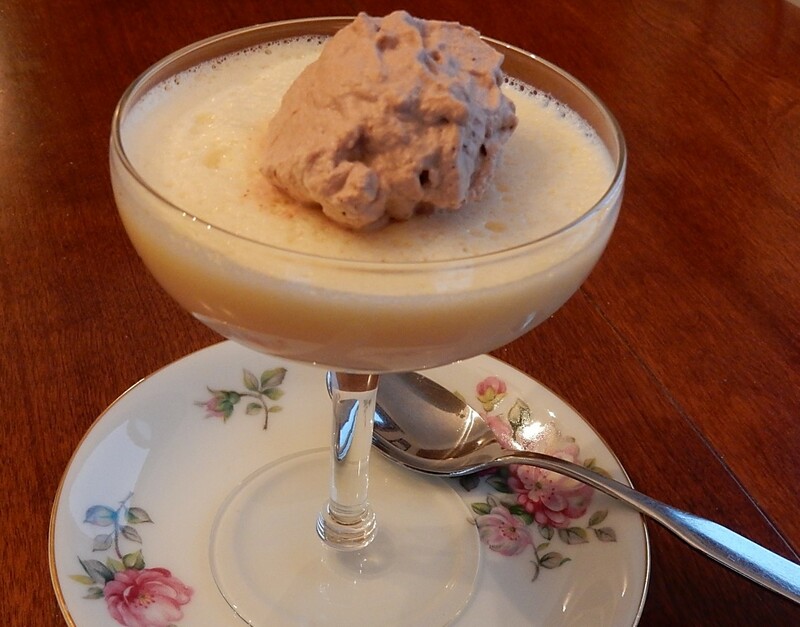 My mother always made a similar dessert but she called it Bavarian cream. Hers was chocolate though with ( non chocolate) whipped cream. We thought it such a fancy dessert. 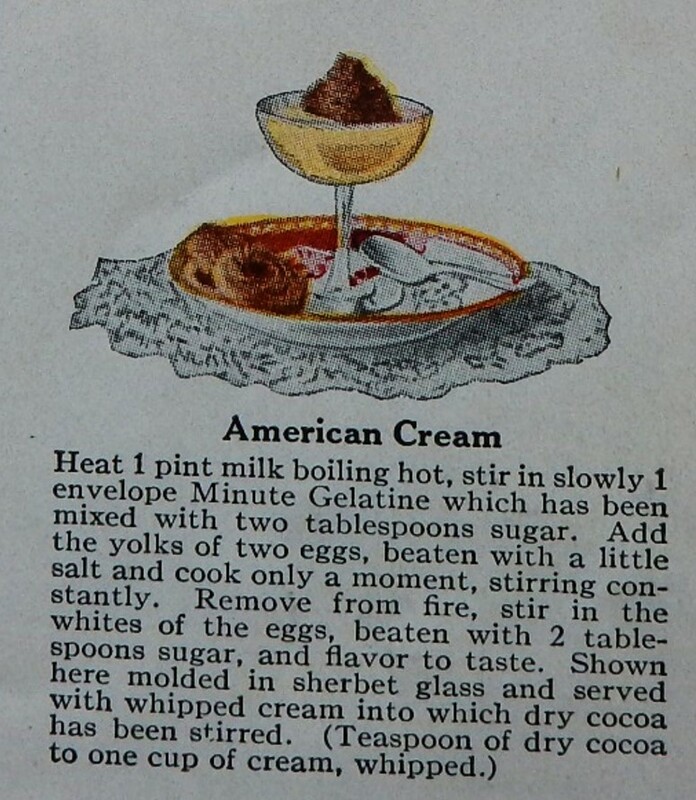 I wonder if it was called American cream in your magazine due to the times as opposed to a Germanic name. I bet that you are right. I know that there was discrimination against Germans in the U.S. during the WWI era, and that many families stopped speaking German at home or in their community. This recipe is from a May, 1916 magazine. The U.S. officially entered WWI in April, 1917 – but there probably was already a movement toward not using names that sounded too German. Oh, how pretty. Looks tasty, too!